Studies of human populations and animal models suggest that a father's experiences such as diet or environmental stress can influence the health and development of his descendants. How these effects are transmitted across generations, however, remains mysterious. Susan Strome's lab at UC Santa Cruz has been making steady progress in unraveling the mechanisms behind this phenomenon, using a tiny roundworm called Caenorhabditis elegans to show how marks on chromosomes that affect gene expression, called "epigenetic" marks, can be transmitted from parents to offspring. Her team's most recent paper, published October 17 in Nature Communications, focuses on transmission of epigenetic marks by C. elegans sperm. In addition to documenting the transmission of epigenetic memory by sperm, the new study shows that the epigenetic information delivered by sperm to the embryo is both necessary and sufficient to guide proper development of germ cells in the offspring (germ cells give rise to eggs and sperm). 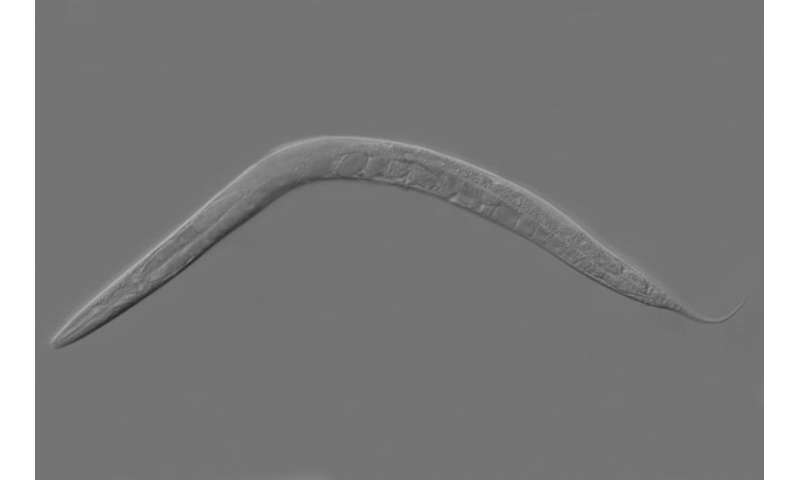 "We decided to look at C. elegans because it is such a good model for asking epigenetic questions using powerful genetic approaches," said Strome, a distinguished professor of molecular, cell, and developmental biology. Epigenetic changes do not alter the DNA sequences of genes, but instead involve chemical modifications to either the DNA itself or the histone proteins with which DNA is packaged in the chromosomes. These modifications influence gene expression, turning genes on or off in different cells and at different stages of development. The idea that epigenetic modifications can cause changes in gene expression that are transmitted from one generation to the next, known as "transgenerational epigenetic inheritance," is now the focus of intense scientific investigation. For many years, it was thought that sperm do not retain any histone packaging and therefore could not transmit histone-based epigenetic information to offspring. Recent studies, however, have shown that about 10 percent of histone packaging is retained in both human and mouse sperm. "Furthermore, where the chromosomes retain histone packaging of DNA is in developmentally important regions, so those findings raised awareness of the possibility that sperm may transmit important epigenetic information to embryos," Strome said. When her lab looked at C. elegans sperm, they found the sperm genome fully retains histone packaging. Other researchers had found the same is true for another commonly studied organism, the zebrafish. "Like zebrafish, worms represent an extreme form of histone retention by sperm, which makes them a great system to see if this packaging really matters," Strome said. Her lab focused on a particular epigenetic mark (designated H3K27me3) that has been well established as a mark of repressed gene expression in a wide range of organisms. The researchers found that removing this mark from sperm chromosomes causes the majority of the offspring to be sterile. Having established that the mark is important, they wanted to see if it is sufficient to guide normal germline development. The researchers addressed this by analyzing a mutant worm in which the chromosomes from sperm and egg are separated in the first cell division after fertilization, so that one cell of the embryo inherits only sperm chromosomes and the other cell inherits only egg chromosomes (normally, each cell of an embryo inherits chromosomes from both egg and sperm). This unusual chromosome segregation pattern allowed the researchers to generate worms whose germ line inherited only sperm chromosomes and therefore only sperm epigenetic marks. Those worms turned out to be fertile and to have normal gene expression patterns. "These findings show that the DNA packaging in sperm is important, because offspring that did not inherit normal sperm epigenetic marks were sterile, and it is sufficient for normal germline development," Strome said. While the study shows that epigenetic information transmitted by sperm is important for normal development, it does not directly address how the life experience of a father can affect the health of his descendants. Strome's lab is investigating this question with experiments in which worms are treated with alcohol or starved before reproducing. "The goal is to analyze how the chromatin packaging changes in the parent," she said. "Whatever gets passed on to the offspring has to go through the germ cells. We want to know which cells experience the environmental factors, how they transmit that information to the germ cells, what changes in the germ cells, and how that impacts the offspring." By demonstrating the importance of epigenetic information carried by sperm, the current study establishes that if the environment experienced by the father changes the epigenetics of sperm chromosomes, it could affect the offspring. Would that explain visual 'memories' through childhood of events experienced by one's father? Need to study children of fathers who have served in war and have PTSD. Siblings conceived before combat and after.